Twitter has just announced a new feature that will add stickers to your photos, which will work like hashtags in regular tweets and enable you to search them like a regular hashtag topic or trend. 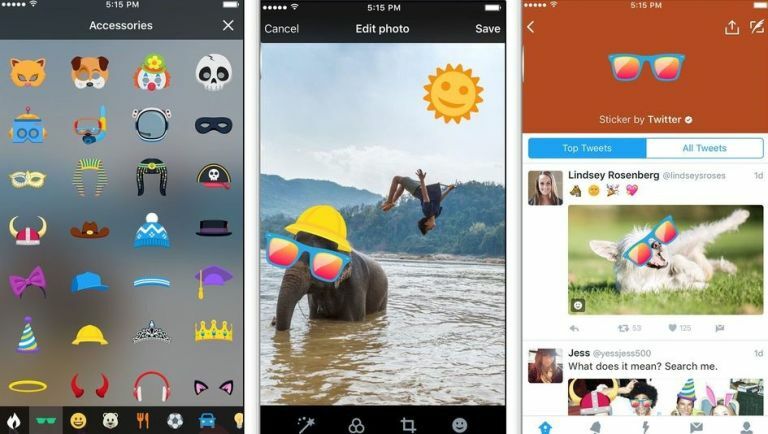 Due to be rolled out across iOS and Android in the next few weeks, #Stickers is all about ensuring any media you post to your Twitter feed isn't lost while all your other tweets remain connected thanks to keywords and fashionably placed hashtags. The feature will enable you to personalise your photos with doodles, stickers, emoji and even hats (yes, hats). There are hundreds of little quirks to add to your pics and you can resize and rotate your shots as well, so if you're looking to show support for a certain cause or event, this is a great way to make every post feel that bit more connected. Unlike the static emojis that have started popping up all over Instagram, the #Stickers on Twitter will take you to an all-new timeline that curates any shot with that chosen sticker and enable you to browse these customised creations to your heart's content. Twitter is clearly getting serious about giving users a far more diverse experience that will match Facebook and the like for additional features and utilities. You'll also be able to use the #Stickers feature in a browser on Twitter.com so however you tweet the everyday machinations of your life, you'll surely have a way to add hats to pictures of your dog.